Sergt. Victor Orton, son of Mr. and Mrs. Charles Orton, of Mansfield Avenue, Quorn. Before joining the R.A.F. he was employed as relief and control clerk on the L.M.S. Railway. He was educated at the Rawlins School, Quorn, and sang in the Parish Church choir. 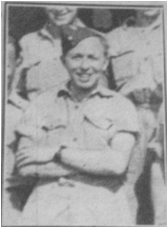 A keen footballer, he played for Halifax Town; also for an Air Force team. He is seen above in an R.A.F. team in India.